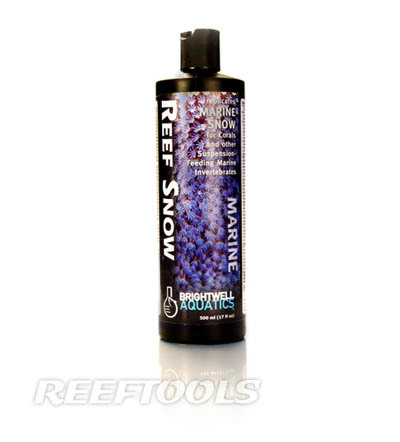 Reef Snow by Brightwell Aquatics delivers a combination of carbonate-bound, non-conservative major, minor, and trace elements in aragonite ratios, in addition to marine-derived proteins and lipid in coral tissue ratios. Intended to replicate Marine Snow, Reef Snow includes both organic and inorganic nutrients beneficial to stony corals, zooxanthellate and azooxanthellate soft corals, gorgonians, clams, tube worms, sponges, tunicates, and other suspension-feeding invertebrates for growth of both soft tissue and skeletal material. Brightwell Aquatics recommends using Reef Snow at night, as most corals extend their polyps for feeding purposes. Reef Snow does not require refrigeration, and should be shaken well before usage. It’s also important to turn off any mechanical filtration, including protein skimmers, for about 10-15 minutes after feeding Reef Snow.